Daily Illuminator: How's Venice This Time Of Yesteryear? September 4, 2018: How's Venice This Time Of Yesteryear? Pack your bags! One of the most beautiful cities in history is a download away, with GURPS Hot Spots: Renaissance Venice. Author Matt Riggsby provides everything you need to make this locale come to life: its history, culture, people, points of interest, food, and more. Although it stands alone, this supplement is an invaluable companion to GURPS Hot Spots: Renaissance Florence . . . Venice's greatest rival. 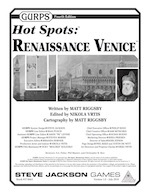 Following the tradition of the GURPS Hot Spots series, Renaissance Venice makes the past accessible, gamer-friendly, and fun! Use its adventure seeds to add spark to the locale, or become inspired by the crossover ideas. Venice is an ideal waypoint, destination, or campaign focus. With Renaissance Venice, your explorers will have a trip of a lifetime . . . and beyond. Download it today, thanks to Warehouse 23!